Looking for a delicious and easy Coffee cake recipe? 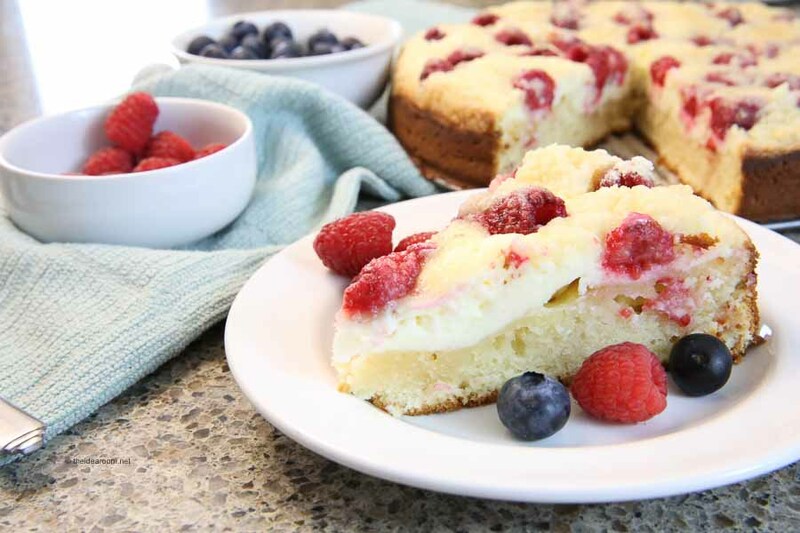 Try our Raspberry Cream Cheese Coffee Cake! 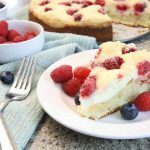 It’s the perfect combination of a Cream Cheese Coffee Cake with the addition of fresh raspberries! I have another delicious Cream Cheese Coffee Cake Recipe for you this week! Raspberries are one of my very favorite things in this world. 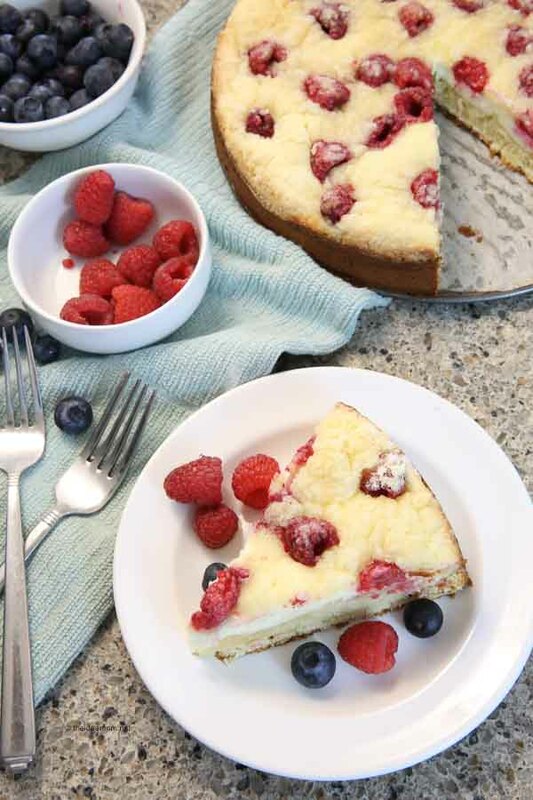 This Raspberry Cream Cheese Coffee Cake Recipe is not as rich as an entire slice of cheesecake, because it also has a layer of cake to go with it. It is really the combination of a coffee cake and a cheesecake without coming off as too rich. I personally am not a huge cheesecake fan, and I find that this is the perfect combination of the two. But, my husband who LOVES cheesecake, also loved this blend of coffee cake and cheesecake together. You can just as easily use blueberries in this if you would prefer. I also think blackberries would be delicious too. 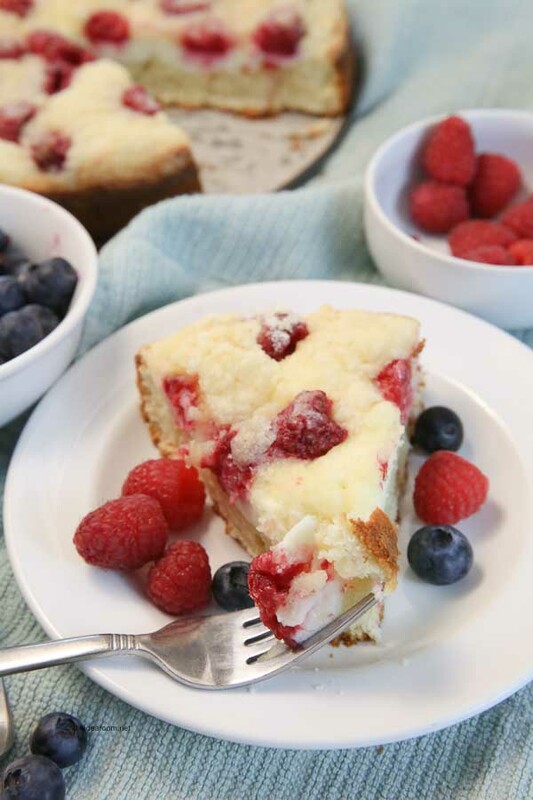 So grab a berry that you like and use it in this recipe! It should turn out just as tasty! An easy and delicious Coffee Cake recipe. 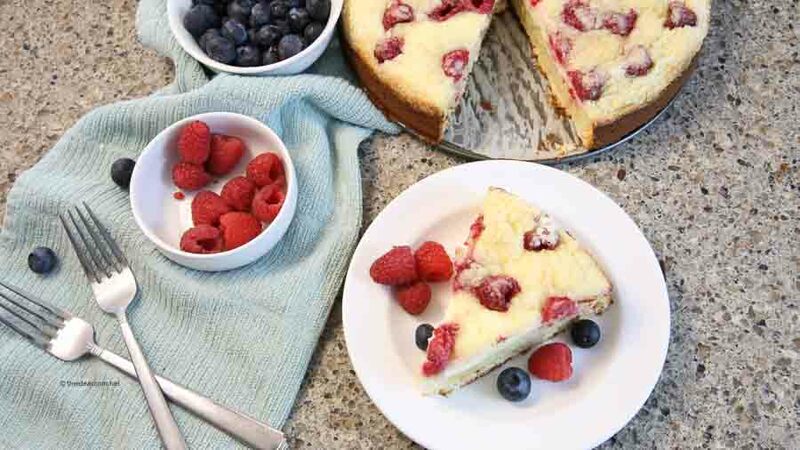 This Raspberry Cream Cheese Coffee Cake Recipe is going to be your new favorite dessert. Grease a 8 or 9-inch springform pan with non-stick baking spray. Make the filling by mixing together the cream cheese and 1/4 cup sugar. Blend until creamy on medium-low speed. Add egg white and mix until just combined and silky. Set aside mixture. To make the cake, combine flour, baking powder, and salt in a separate bowl. Set aside. In the bowl of a mixer combine butter and 1/2 cup sugar on low speed. Add vanilla, egg, and egg yolk and blend. Slowly mix in the flour mixture alternating with the sour cream. Spoon the batter into the prepared pan and smooth top. Carefully the cream cheese filling over the top. Smooth evenly. Place the raspberries onto the cream cheese filling. Make streusel by combining flour, sugar, and butter in a bowl. Work ingredients together with a pastry cutter until crumbly. Bake for 40 to 45 minutes at 350 degrees F.
Make and share with your friends and family…or keep it all for yourself! Perfect for breakfast or a dessert! Yum, looks so good. I want it now haha. Crackmacs- It is so tasty. You should really make some! Kathy- Hope your family enjoys this recipe! It really is delicious! Do you need to refrigerate this coffee cake because of the cream cheese layer? Alicia-Yes, I would refrigerate it. Hope you enjoy the recipes.